Here's my Quick Card for today. I really love being able to turn out a card quickly when I need to. Not that I don't enjoy spending a lot of time making cards when I have the time but you and I both know that lives are busy and we don't always have that luxury! Today's card was created for a friend that did me a huge favor. 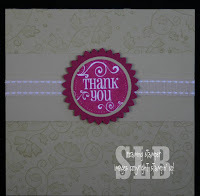 I needed a thank you card and was anxious to try out my new Lovely Labels set. This card measures 4 1/2 x 4 1/2 and took under 10 minutes to create! All products are available from Stampin' Up! *Scallop punch used to make the medallion! I had forgotten we could use the scallop punch this way. Thanks for the great quick card!